As you may know if you follow me, I tend to tweet a lot. This is especially true at conferences, where I engage in Live Tweeting (sending summary tweets of main points the speaker is making while the presentation is ongoing). Some followers have told me that they appreciate my live tweeting, and that I’m good at finding the core thesis and presenting it, sometimes with my own commentary attached. And while I’m happy that at least a few people find value in my on-the-scene tweeting, that’s not why I do it. I live tweet to take notes. I hate carrying stuff. I just don’t like to have objects in my hands that are bigger than an iPhone. I’m not really expecting to need to unleash some sudden karate moves, but in the literal sense, I don’t like to have my hands full. Which is why live tweeting is so useful for me. I can communicate some information of interest to others, while creating digital notes that I can refer back to later. No pen. No paper. No laptop. Just two ears, two thumbs, and an iPhone. 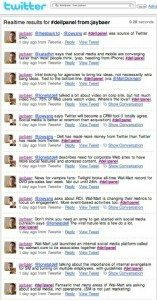 Here are my Twitter notes from an intimate session at South by Southwest on enterprise social media. The panel featured John Andrews @katadhin from Wal-Mart, Bryan Rhoads @bryanrhoads from Intel, and Lionel Menchaca @lionelatdell from Dell moderated by Jeremiah Owyang @jowyang from Forrester Research. 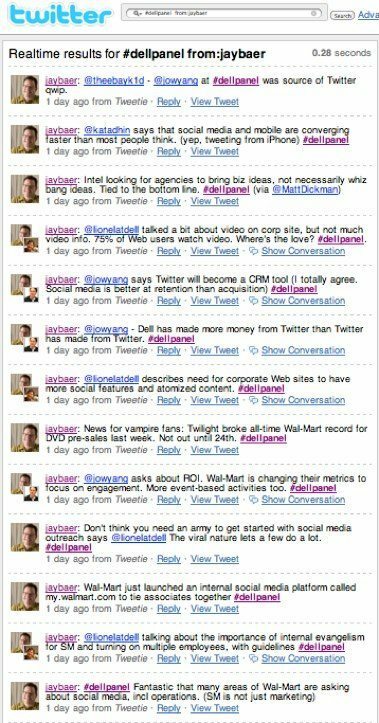 I grabbed this version of the live tweeting (just my notes) by going to http://search.twitter.com and searching for the event tag (#dellpanel) and (from:jaybaer).